Please be aware that the Museum of the Cariboo Chilcotin will be closed for the Easter Long Weekend including Good Friday (April 19) and Easter Monday (April 22). We will resume our regular winter/spring hours of Mon-Fri 9 AM to 5 PM on Tuesday April 23. We apologize for any inconvenience and we look forward to seeing you after the weekend. The Museum of the Cariboo Chilcotin is seeking candidates with interests in local history and tourism to complete administrative projects and assist with general operations. Experience in office administration and staff supervision is an asset. Please send a resume and cover letter via email to the Museum Coordinator at mcc@wlake.com in advance of the deadline. We thank all applicants for their interest – only those selected for an interview will be contacted following the application deadline. 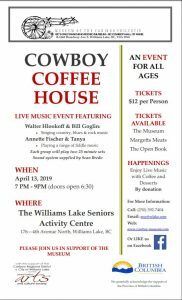 Join the Museum of the Cariboo Chilcotin for their upcoming Cowboy Coffee House! It will be held Saturday April 13th, 2019 from 7-9pm at the Williams Lake Seniors Activity Centre! This event is open to ALL ages, and will feature live music from Walter Hlookoof, Bill Goglin, Annette Fischer & Tanya. Enjoy live music, coffee, tea and desserts! Tickets are $12 per person, and are available to purchase at the Museum, Margetts Meats or at The Open Book. Are you currently enrolled in and returning to full-time secondary or post secondary studies? The Museum is hiring! We are looking to find students who are seeking summer employment and have interests into local history, to complete curatorial projects and assist with the operations of the museum for summer 2019! This is seasonal full time employment between early May and the end of August 2019! Please clink the attachment below to find out more about this incredible opportunity! Application Deadline is April 30th, 2019. 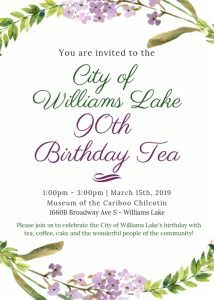 The Museum would like to invite the community to attend the City of Williams Lake 90th Birthday Tea! Join us to celebrate Williams Lake’s 90th birthday with tea, coffee and birthday cake! We hope you will join us March 15th, from 1pm-3pm! 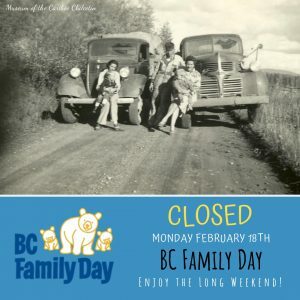 The museum will be closed for BC Family Day on Monday February 18th, 2019. We will resume regular hours of 9am – 5pm on Tuesday February 19th. We would like to wish you and your family a wonderful long weekend and a great Family Day! The Museum is very excited to start working on a cartographic history exhibition in anticipation of the next summer season with this grant! A big thank you goes out to the Central Cariboo Arts and Culture Society for funding this project. Also thanks to the Cariboo Regional District, and the City of Williams Lake for their continuing support of arts and culture programming. Please click this link for the announcement of the Support Grants! 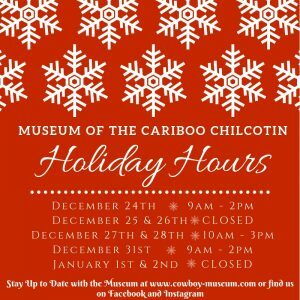 The Museum of the Cariboo Chilcotin would like to wish you a very Merry Christmas from the Directors, Staff, Volunteers & Members of the Museum! We would like to congratulate and recognize the 2019 BC Cowboy Hall of Fame Inductees! Congratulations to all inductees! Inductions will take place at the Kamloops Cowboy Festival Friday evening, March 15th and at the Williams Lake Indoor Rodeo held Sunday April 28th. 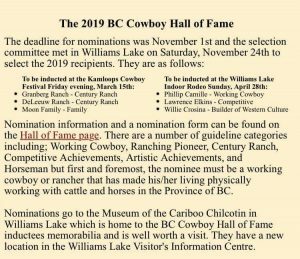 Please see below photo for more information or visit BC Cowboy Hall of Fame website. Christmas Tea & Bake Sale! 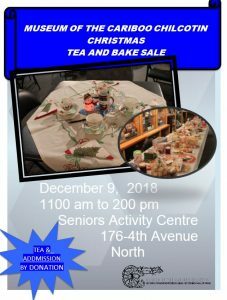 Join the Museum of the Cariboo Chilcotin Society on December 9 at 11 AM at the Seniors Activity Centre (176 – 4th Avenue North) in downtown Williams Lake as they prepare for their annual Christmas Tea and Bake Sale in support of the Museum. There will be cookies, squares, and all manner of tasty goodies! Tea is by donation. We look forward to seeing you there!